The study of our bodies at the microscopic level is called histology. Here are three stages of injury and healing that may help you to understand tennis elbow and therefore be better able to direct your own care. 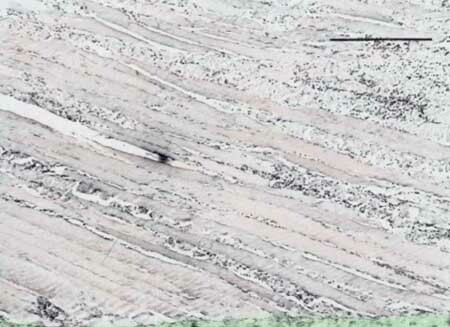 This is a microscopic view of a muscle (artificially colored pink) and its insertion into a tendonous tissue such as Sharpie's fibers (artificially colored green). 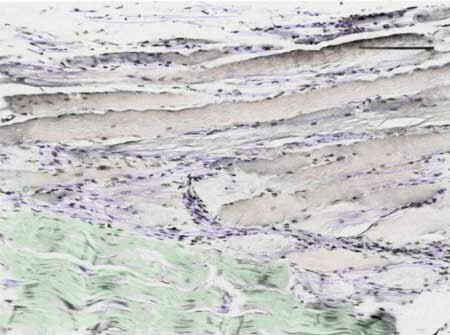 This is a microscopic view of a muscle (artificially colored pink) and its insertion into a tendonous tissue such as Sharpie's fibers (artificially colored green), 48 hours after a muscle tear. Compare this view to the one above. Notice the large number of slightly blue cells, which are the inflammatory cells. 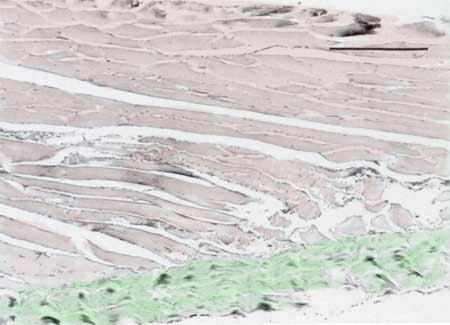 This is a microscopic view of a muscle (artificially colored pink) and its insertion into a tendonous tissue such as Sharpie's fibers (artificially colored green), seven days after an injury. Notice that there are fewer inflammatory cells (artificially colored blue).